Since the Meethotamulla Garbage problem has been dragging on for nearly 30 years, it is unfair to point the accusing finger at the present government with regard to the recent tragedy that occurred there, Most. Ven. 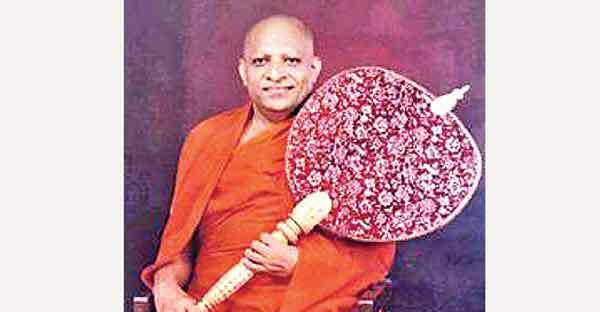 Thibbotuwawe Sri Siddhartha Sumangala Mahanayake Thera of the Malwatte Chapter said. The Mahanayake Thera said only two years, have passed since the present government came to power and these two years are inadequate to resolve such a longstanding problem of this nature. The Chief Prelate expressed these sentiments delivering an Anusasana when Deputy Speaker Thilanga Sumathipala called on him at his temple in Kandy and received his blessings yesterday. The Malwatte Mahanayake Thera said as a result of the Meethotamulla tragedy, people elsewhere protested against the dumping of garbage from Colombo in their areas,since they had no trust in pledges held out by politicians. “At this moment of grief, everyone should join hands to provide succor to the affected people without making utterances for pure political gain, the Malwatte Chief Prelate said. Deputy Speaker Thilanga Sumathipala said that even though former President Mahinda Rajapaksa made various statements for political gain, the project planned by his regime to take Colombo’s waste to Puttalam to fill limestone quarries was extremely unsuccessful and had to be abandoned. Now they were making various unfounded statements to wash their hands off the Meethotamulla problem. Sumathipala said the Puttalam project was only a colourful pipe dream which was impractical. “Nearly 8,000 tons of waste was collected from the Colombo urban areas. One goods wagon in a train could accommodate only 40 tons and one could imagine what a lot of wagons would be needed to transport such a load of garbage daily,” he said. “Even a grade two student would not put forward such a weak plan or programme,” the Deputy Speaker added. “The need of the hour was the establishment of a national institution to handle garbage management. The Government, Provincial Councils and Local Government institutions should join hands to work out a national policy and programme in this direction,” Sumathipala said. Central Province Chief Minister Sarath Ekanayake and Sri Lanka Cricket National Projects Secretary Sujeewa Godaliyadda were also present on the occasion. Is Sumathipala Grade 2 qualified? Well said. All those who were in power through these many years including the present Government must be hauled up in courts and be punished.